Four Sammees (British slang for the US soldiers recruited by Uncle Sam) were ordered shot for sleeping on duty have been ordered executed. 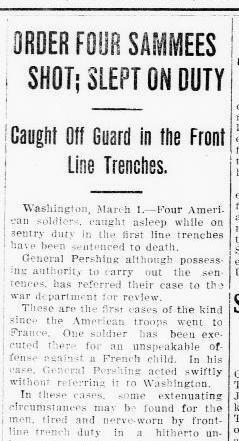 Pershing has already executed a soldier for abuse of a French child, but has asked for War Department review of the sleeping soldiers. Cambridge, Maryland folks are buying smileage - entertainment bonds for the troops - and in the Madison, Maryland there is a minstrel show plays to "peals of laughter." In Galway, Ireland, the U.S.flag is burnt by Sinn Feiners.